Christmas is best spent with friends and family, and hopefully those count as people you actually like! Well, I invited a few folks to join in the Christmas Ornamentation fun, because...well...I like them and want to celebrate together! Amanda and I only recently "met" online, but I've been secretly admiring her quilting and sewing and photography for a long time. Please welcome her, and be sure to pay her a visit! 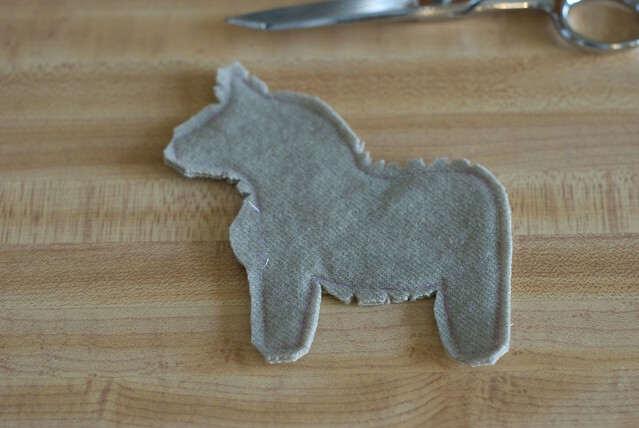 My name is Amanda (aka Mrs.McPorkchop) and today I'm going to show you how to make a Dala Horse for your tree or even as a cute sweater broach. This is a great way to use up little scraps and bits of trim. 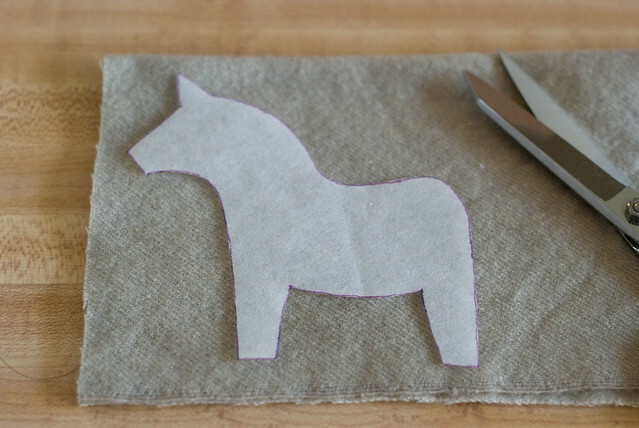 Download the Dala Horse Template Here. You can feel free to use other materials, embroidery, sequins, vintage fabric, etc. 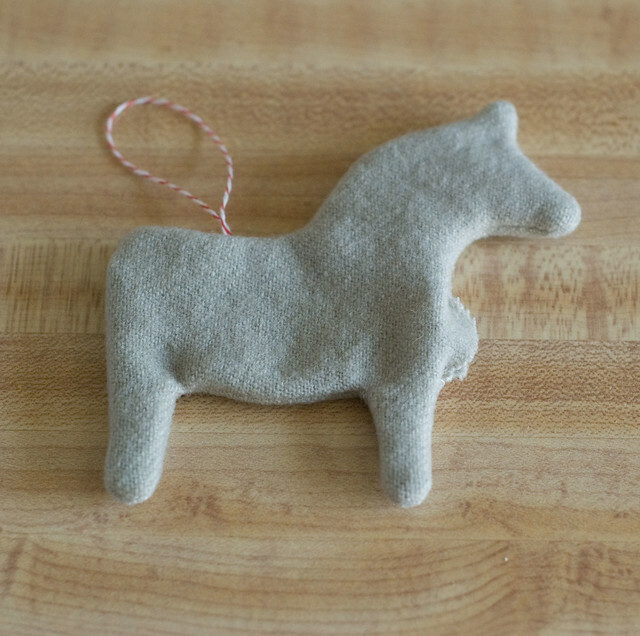 The list goes on and on and you can create a bunch of little horses in whatever fashion your little heart desires! Start by gathering the materials. Trace the template onto the wrong side of your fabric. If you want to decorate or embellish the fabric, now is the time! Next lay your wrong sides of fabric together. Decide where you'd like the trim loop for hanging to be. I placed mine on his back and I think my next one will be closer to the horses neck so he hangs a little nicer. Have the loop face into the horses body with the raw edges hanging towards the raw edge of his back. Follow the line you've drawn on your fabric with your sewing machine. Go nice and slow around the curves. 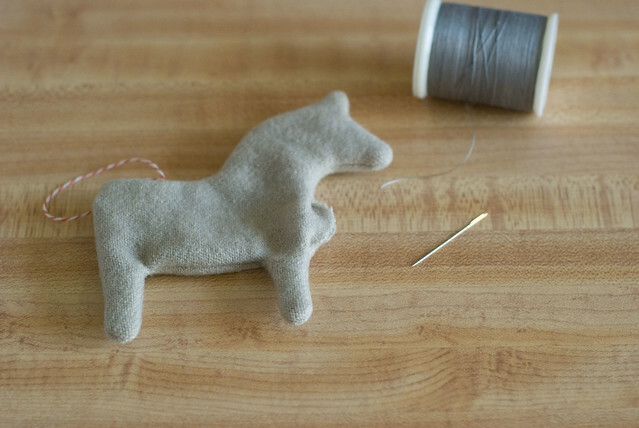 Stop and back stitch after you've sewn his front leg and again under his chin. This is where you'll turn him right side out! Clip his seams! This step is important or his body won't be nice and smooth. But make sure you don't accidentally clip the threads of the stitching though! When I have to turn something, I like to cut a larger seam allowance, it makes it easier to get a nice even outer seam after turning. After you turn it you might end up with a little lump! That's ok! 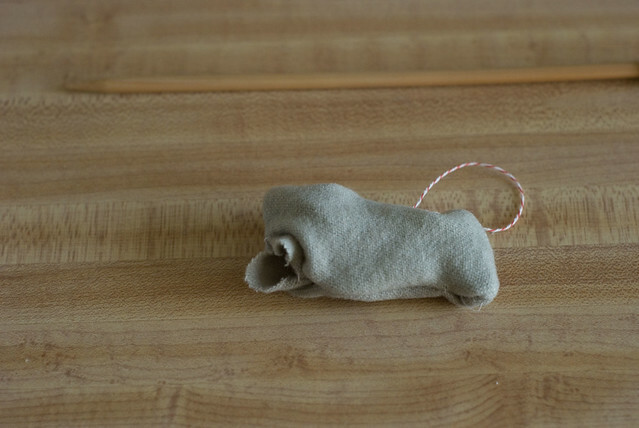 Use a paint brush end, a skewer, a knitting needle, etc to gently push his legs and horn out. Make sure you don't push too hard or you'll poke through the fabric. If you desire, you can add a little stuffing to him at this point. Hey! Look! 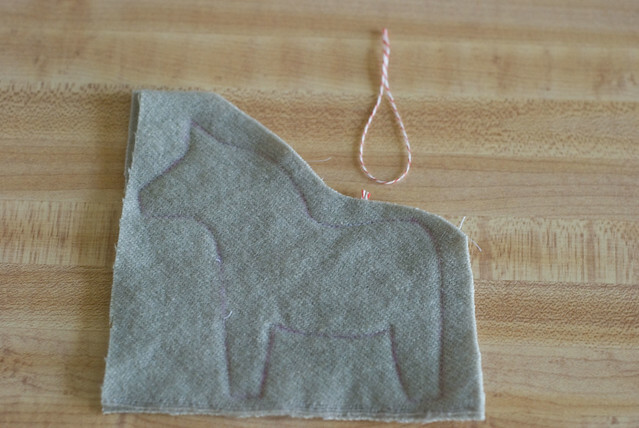 A little cute Dala Horse!! Grab your needle & thread and slip stitch (or stitch of your choice! Or machine top stitch! Or embroider little x's! whatever you'd like!) his opening closed. 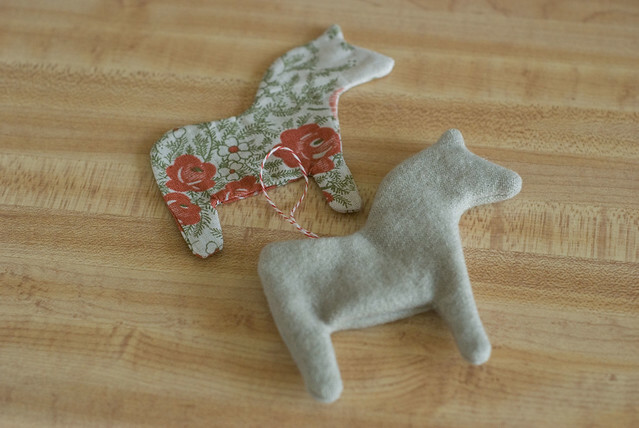 I decided not to add a loop to the red & green horse, I might attach a bobby pin to him & wear him in my hair or a safety pin & wear him as a brooch! Sky's the Limit! And thank you, Amanda! My mom is going to have me making dozens of these for her...we're very Swedish at my house!